For the convenience of our patients the Practice policy is to perform hearing testing at the time of consultation where applicable. 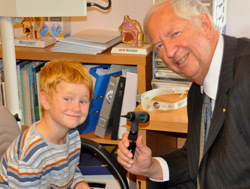 Because of the constraints of time, the child’s cooperation or underlying medical problems, the hearing assessment may not be adequate at the time and the child may require further hearing assessment at a specialised centre, such as the Telethon Speech & Hearing Centre, Lions Hearing Centre, Princess Margaret Hospital for Children, Child Development Centre or Australian Hearing Services. Infants and very young children will be tested, where possible, by specialist graduate Audiologists in the Rooms. Otoacoustic emission testing facilities are available for newborn and objective testing of hearing function. - Graduated from the University of Queensland with a Bachelor of Speech Therapy and Honours in Audiology. Thesis topic was the Auditory Brainstem Response (ABR). - Career has included rehabilitation services- paediatric and adults at Australian Hearing Services and private audiology clinics. - Senior audiologist in a private audiology clinic which provided diagnostic-ABR and vestibular testing and rehabilitation services for hearing loss and tinnitus. - Involved in aboriginal ear health and providing services to remote regions in Western Australia. Currently visit Exmouth and Carnarvon. - Currently working with a number of private paediatric ENT specialists in the Perth metropolitan area. Like to make a booking or find out more about a specific condition? Call us today on (08) 9389 1622 or head to our Contact Us page and send us a message via the website.